Chat with your friends with this group-based audio chat software for Windows. VoIP is a huge deal. Making calls to friends and loved ones across the internet is easier than ever to do today. This is one reason why I like apps like RaidCall, It’s an audio chat client for Windows. RaidCall is free and light weight. Setting it up is very easy. With it, you won't have to rent or set up local chat servers. Its low CPU usage and minimum memory footprint also allow for smooth, uninterrupted communication between you and your call recipients. RaidCall supports Group Communications, too. 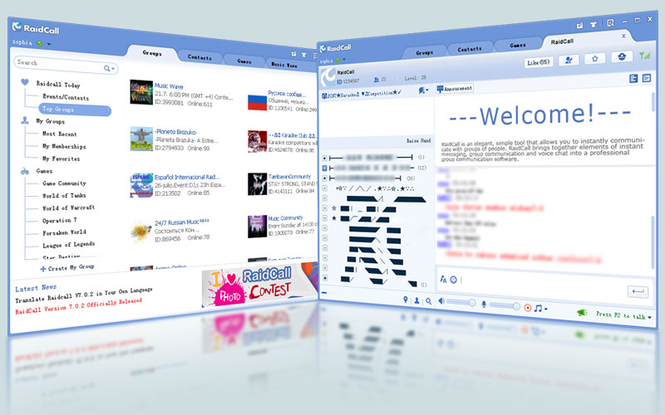 You can have up to 10,000 users at a time in a single RaidCall group and has a flexible group management system. The client supports Hi-Fi quality voice chat from anywhere in the world; and has additional features like a voice recorder, polling, announcements, and an activity log. RaidCall also supports instant messaging. Aside from passing text messages back and forth, the app also handles file transferring and screenshot sharing, and chat records. It also supports personalized themes and emoticons. Conclusion: RaidCall is a decent VoIP client, but is seriously lacking in video calling support. With apps like Skype and FaceTime readily available (depending on platform) that support both audio as well as video chat, for many, RaidCall may be a non-starter in the consumer market. For SOHO, it may be a decent choice, as video chat may not be a huge need here. However, the lack of video chat support in a client like this is a huge hole. Even though it’s free, there are other aps out there that are likely a better choice.